Halloween is almost here, and #SundaySupper is teaming up with our good friends at Gallo Family Vineyards to bring you a collection of frightfully fun food and beverages that will help you set the perfect scary mood! All of the recipes that are being featured today either have Gallo Family Vineyards Merlot or Red Moscato as an ingredient in the recipe OR they're paired with one of these two featured wines. Since Halloween falls on a Friday this year, I decided to create a spooky cocktail! I opted to make a fun adults-only punch that features Gallo Family Vineyards’ Red Moscato. Moscato is one of my favorite wines, so I wanted to showcase its lovely sweetness. My Ghoulishly Good Red Moscato Punch is fruity...and a bit fizzy! It contains Gallo's sweet and refreshing Red Moscato, orange liqueur, a duo of fruit juices, and citrus soda. A ghoulish ice hand floats eerily in the punch bowl. I’ll even show you how easy it is to make the icy hand as part of the recipe! • 1 latex glove -- try to find ones that aren’t powdered. If not, make sure to clean it VERY THOROUGHLY with hot water before using! Step 1: Make the ice hand. Use a measuring cup to fill a clean latex glove with water nearly to the top -- make sure the water gets into every finger. Twist the top of the glove and secure tightly with a rubber band. Place the filled glove in the freezer until frozen solid -- I like to make it a day ahead. Step 2: Add the chilled Red Moscato, orange liqueur, fruit juices, and citrus soda to a decorative Halloween punch bowl. Just before serving, remove the ice hand from the freezer. Use scissors to cut just below the rubber band and carefully peel the latex glove away. Float the ice hand in the center of the punch bowl. Since my decor theme is scary spiders, I placed small plastic spiders into my punch to float around the hand! This wine-based punch is full of fruity flavors -- and the deep red color is reminiscent of blood! The sweet Gallo Family Vineyards Red Moscato pairs very nicely with the fruit juices -- and the light fizz is really fun. I hope that you’ll whip up a batch of this refreshing grown-up punch at your upcoming Halloween parties...it’s sure to be a hit! 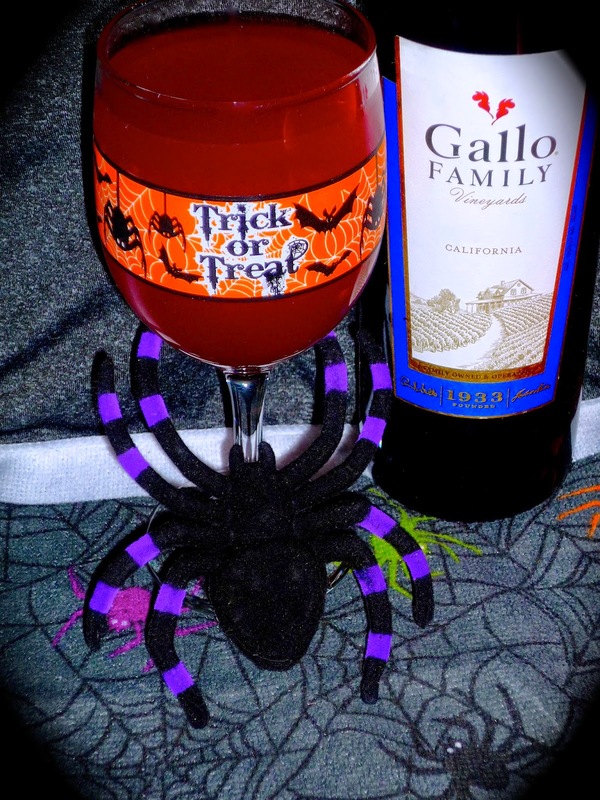 Be sure to visit Gallo Family Vineyards for more Frightfully Fun Entertaining Ideas. The Gallo website also features a handy Store Locator and a $1 off digital coupon. You can also follow Gallo Family Vineyards via Facebook, Twitter, Instagram, and YouTube for lots of great wine tips! While you’re at it, be sure to go check out all of the spooktacular Halloween recipes that this week’s #SundaySupper participants are sharing...don’t be scared! Whether you’re looking for a themed Halloween dinner idea or a creepy-good beverage, we’ve got you covered. Sunday Supper Recipes, be sure to visit our website or check out our #SundaySupper Pinterest board. Would you like to join the Sunday Supper Movement? It’s easy. You can sign up by clicking here: Sunday Supper Movement. Disclosure: Compensation was provided by Gallo Family Vineyards via Sunday Supper, LLC. The opinions expressed herein are those of the author, and are not indicative of the opinions or positions of Gallo Family Vineyards. I love this Wendy! How creative with the hand. Now I want a glass!